Z-ABS is a Zortrax filament compatible with the Zortrax brand for the M200 3D printer. Manufactured by the owner, these ABS filaments are guaranteed compatible. ABS produces solid, shock-resistant prototypes. 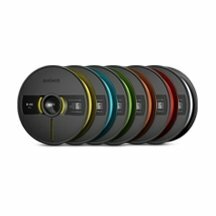 Z-ABS spools are available for you to purchase online, in many different colours at the best price. Zortrax Z-ABS filaments are filaments that as their name indicates are made of ABS ,which is one of the most used base for 3D printing with PLA. ABS is easy to print, and allows to create quality prototypes very quickly. It is a filament that will make your creations very solid. Check out all our tips and guidance for printing Z-ABS in the relevant product descriptions. Our 3D printing experts are happy to help in the event of any problems. The settings for printing Z-ABS are automatic with the M200 printer, the settings are configured directly so that no specific action is required on your part.